Athletes are constantly scrutinised for their ability to perform well, compete honestly and uphold values in sport. This Targeted Topic on Straight Science shines the light inwards on the performance, honesty and standards of research in sports science and medicine. Our Guest Editors, Clare Ardern, Adam Weir and Rod Whiteley take us on a guided tour through the research landscape, along with a superb line-up of contributing authors, who examine the incongruous relationship between research output and clinical requirements, and how sports science reports are really used in the field (and on the field! ), as well as answer the question: can we really predict which athletes will get injured? We also look at how clinicians can avoid ‘shazam’ therapies and overdiagnosis; and how can researchers use the right statistics to improve the quality of their research, and translate knowledge to practitioners effectively, despite often finding themselves at odds with the publishing industry. 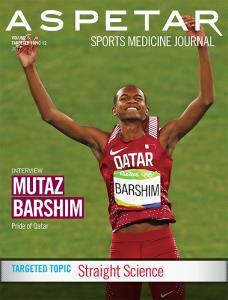 Finally, we interview high jumper and the Pride of Qatar, Mutaz Barshim. The nation’s most successful Olympian, who tells us about competing with a fractured vertebra, the importance of providing an athlete with clear medical information and his key relationship with his experienced coach. EDITORIAL: Sports medicine in 2017 – do we know where we are going? Down the rabbit hole or jumping over it?